Adapting to climate means reducing the vulnerability of a system to the climate pressure. This vulnerability is a function of the climate exposure, the sensitivity of the ecosystem and the human adaptive capacity. Adapting Montado landscapes to climate change is, therefore, a complex task since it includes integrating the information and uncertainty of climate scenarios and climate impacts with the vast science of agronomy and forestry on topics such as the management of soil, water, species, diversity, microclimates, topography, agricultural practices, markets, information and governance. At Herdade da Ribeira Abaixo we have developed a participatory plan of adaptation to climate change, using state-of-the-art knowledge on the efficacy of adaptation measures and the SWAP methodology. In the context of the LIFE project entitled “Montado & Climate: a need to adapt” we are now implementing the adaptation plan in 100 hectares, showcasing and testing several adaptation measures at cE3c’s field station. Many aspects in this field are still of interest to research and practice: the monitoring of the system; the efficacy of the adaptation measures; the combined effect of the adaptation measures; the autonomous adaptive capacity of the species and ecosystem; the choice of the agricultural practices and adaptation measures; the governance, management and financial challenges of the Montado farms; the replication potential and dissemination to farmers of successful practices; the combination of mitigation, adaptation, conservation of biodiversity and other sustainable development goals in the management of the Montado farms. 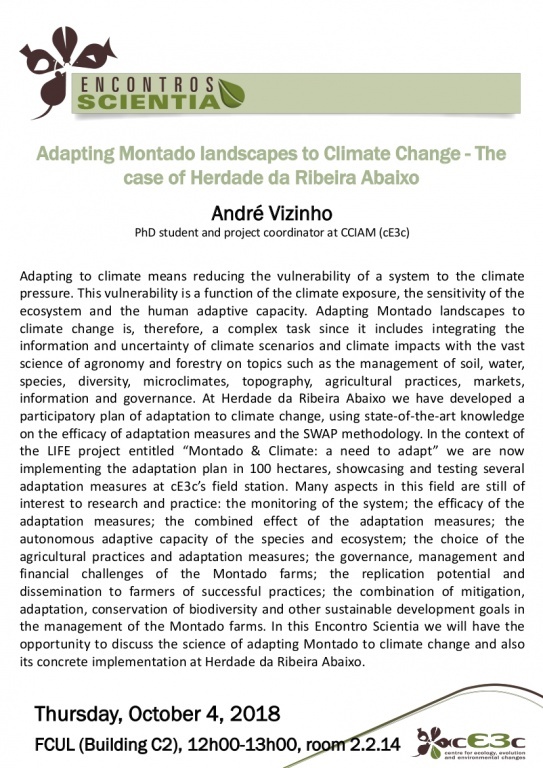 In this Encontro Scientia we will have the opportunity to discuss the science of adapting Montado to climate change and also its concrete implementation at Herdade da Ribeira Abaixo.